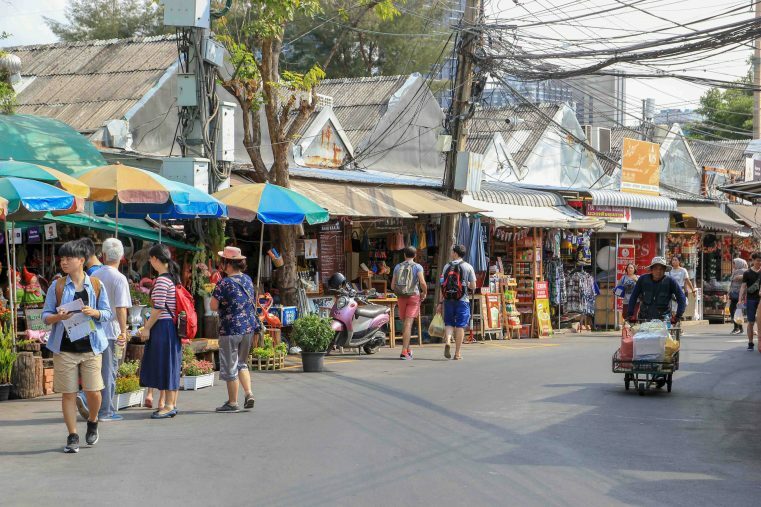 The Chatuchak Weekend Market is considered to be the nr.1 shopping paradise in Bangkok and due to its imposing size, it even calls itself the world’s largest weekend market. The offer of this approximately 1.1 square kilometer large market seems to be almost unlimited and so everyone will find something interesting here. Unimaginably many shops and stalls are lined up in the streets and every weekend around 300,000 people come to enjoy this shopping mecca. 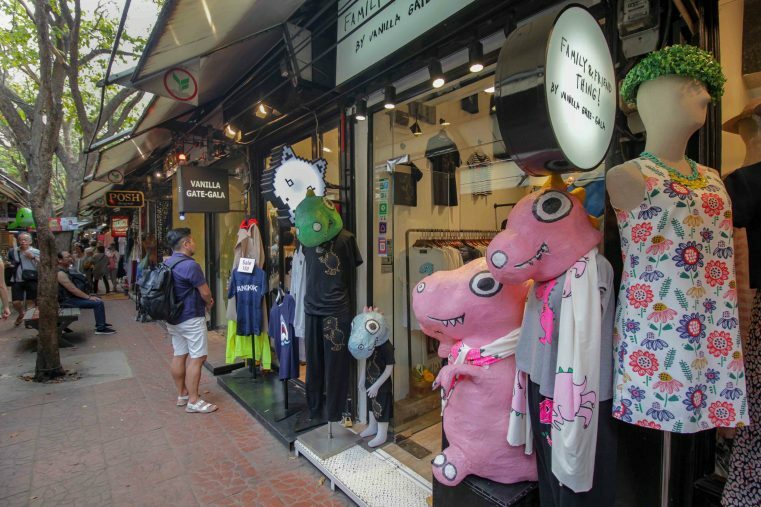 There is almost nothing that does not exist here: starting with hip clothes and jewelery, beautiful paintings, interesting antiques, thai handicrafts, food, art by local artists, plants, furniture, delicious restaurants, good cafes to the popular souvenirs. 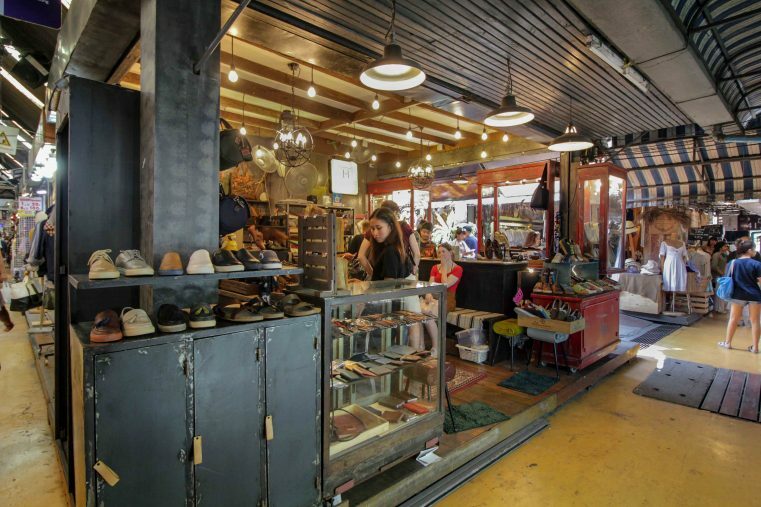 Here is our guide to Chatuchak weekend market. 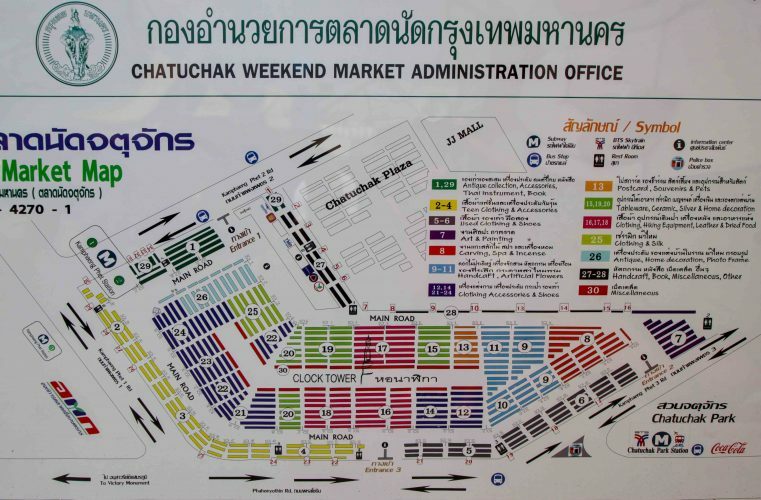 You will find a map for orientation, useful information and tips about oping hours, getting there and what to buy at Chatuchak Weekend Market. 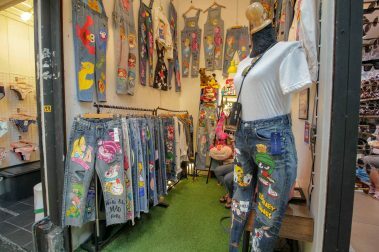 A visit to Chatuchak Weekend Market is a pure Bangkok market experience. 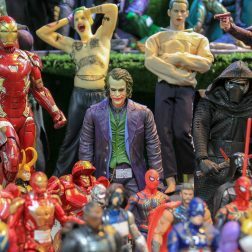 With a seemingly endless selection of products in a huge maze of shops and stalls, the market is considered to be one of the largest markets in the world. We were overwhelmed by the huge offer of goods and the very reasonable prices. There is a fantastic selection for clothes and there we found the best shops. Especially the small designer shops, which creatively sell their own products, are really interesting. Even if you like second-hand and vintage clothes this market is just right places for you. Here you will find age-old branded handbags, jerseys, washed-out branded jeans and newly prepared shoes. 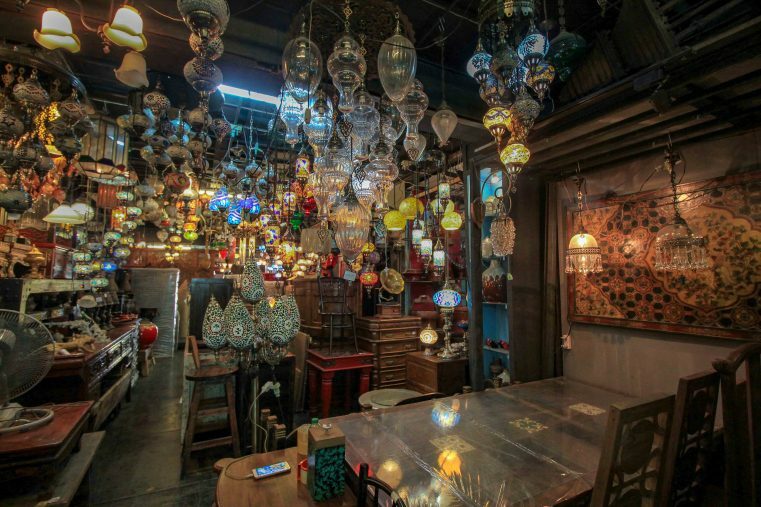 Also recommended is a shopping tour to the antiques department and the area where local designers exhibit their furniture. Rarities and unique pieces can be found here. Another highlight that you should not miss is the ceramic department. 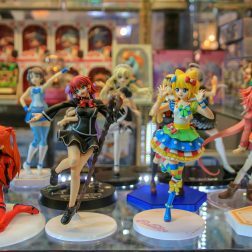 Tip: If your treasures do not fit into the suitcase, shipping to Europe and US is offered at most stands. Between the different areas there are plenty of small stalls which serve cool drinks and small snacks. One more thing that makes the shopping at Chatuchak Market really pleasant. If you are getting hungry you will also find some nice restaurants and good street food in the area. Those who are exhausted because of a long shopping tour, can recover their feet by getting a Thai massage directly inside the market. The market is divided into 27 sections. Sights in front of the narrow streets will show you where you are right now. Either you can stroll through the market and explore alley for alley or you follow the map and visit the locations of your choice. Section 1: Here you will find amulets, books, collectibles, some grocery stores and cafes. 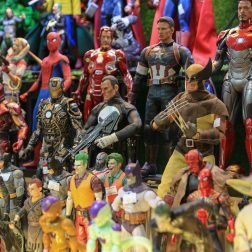 Section 2 to 4: In these departments are beautiful furniture, paintings and ceramics, facilities and collectibles. 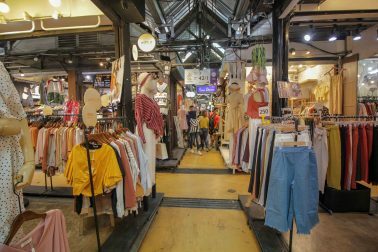 Section 5 to 6: Here you will find great clothes, both hip designer clothes and second-hand goods. Also beautiful fashion jewellery, watches and cool accessories are offered. Section 7 to 9: In this section, antique lovers will certainly find something. It also offers arts and crafts, furniture and ceramics. 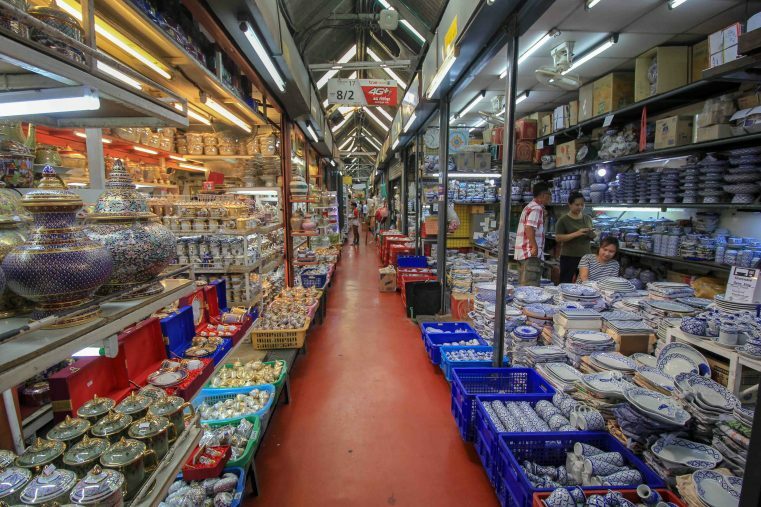 With an overwhelming selection of sections and stalls, you could get lost quickly. With this map you can check out the location in advance and decide which sections might be interesting and where to go. Also, a map can be found at the main entrance to the market. We had a great experience with just using Google Maps inside the market. Where is the Chatuchak market? 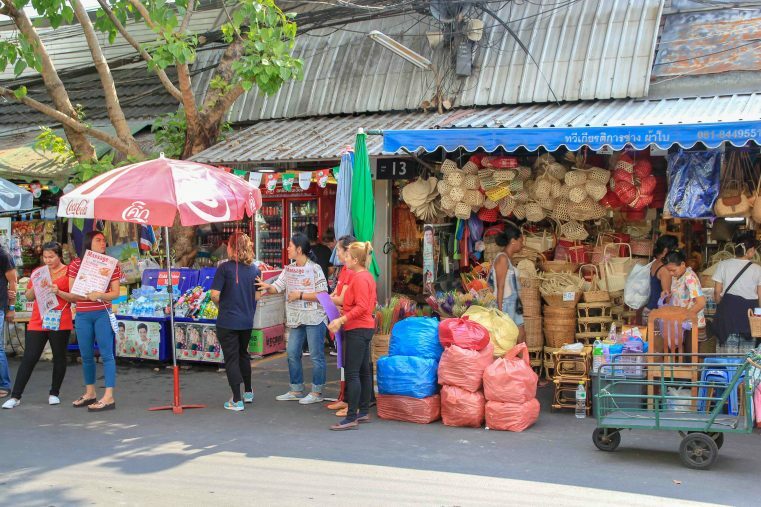 Chatuchak Market is located in the north-eastern part of Bangkok, more precisely in the Chatuchak district, and it is well connected to the public transport system. Getting to Chatuchak is quite ease: To get there, take either the Skytrain or the Metro. The nearest BTS Station is Mo Chit or the MRT (Subway) Station Chatuchak Park. Of course, you can also easily take a taxi to the entrance of Chatuchak, which are really cheap in Bangkok. 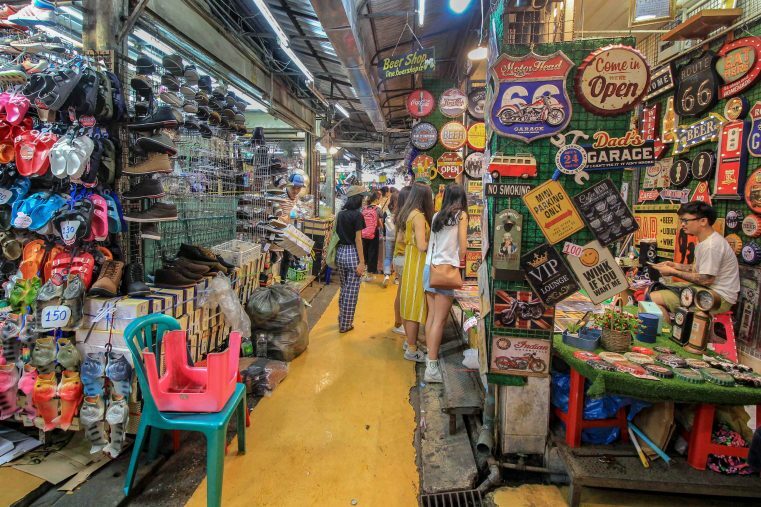 When is the Chatuchak market? Morning (9:00 clock) is the best time to visit Chatuchak Weekend market. At that time just a few visitors can be found there. At noon, it gets really busy! Take some water with you. Although the Chatuchak is mostly covered, it is really hot inside! Haggling is a must-do on the market. With some bargain-skills you can achieve amazing prices here. Cash is king! Take enough cash with you, hardly any shops accept credit cards or debit card. The “pets” department was, to us, morally questionably and can definitely be skipped. If you are tired of the hustle and bustle, just visit the nearby green Chatuchak Park and relax by the lake. 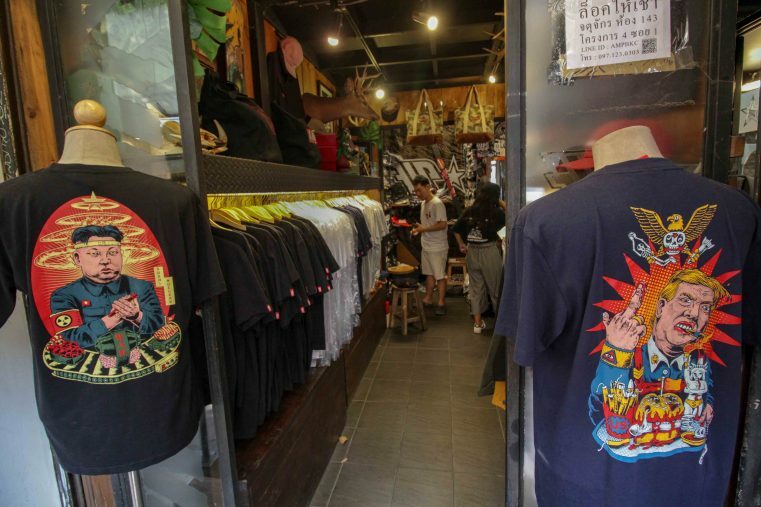 Conclusion: We can absolutely recommend a shopping tour to Chatuchak market. Above all, the huge size and variety of goods make the market to a must-see market in Bangkok! If you spend the weekend in Bangkok, then you should definitely plan a visit!